Aerodynamic design for smooth and quiet operation.. Revolutionary frameless wiper blades with improved design and performance over conventional blades.. This frameless wiper blade technology is the new generation design adopted by car manufacturers.. Integrated flexible spine secures the rubber blade in a seamless structure..
Autofurnish AF6473 Frameless Driver and Passenger Side Wiper Blade Set For Mitsubishi Lancer is a premium quality Wiper Blades from Autofurnish. Moglix is a well-known ecommerce platform for qualitative range of Wiper Blades. 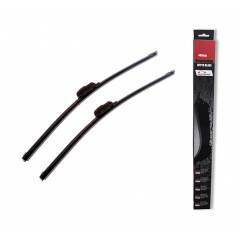 All Autofurnish AF6473 Frameless Driver and Passenger Side Wiper Blade Set For Mitsubishi Lancer are manufactured by using quality assured material and advanced techniques, which make them up to the standard in this highly challenging field. The materials utilized to manufacture Autofurnish AF6473 Frameless Driver and Passenger Side Wiper Blade Set For Mitsubishi Lancer, are sourced from the most reliable and official Wiper Blades vendors, chosen after performing detailed market surveys. Thus, Autofurnish products are widely acknowledged in the market for their high quality. We are dedicatedly involved in providing an excellent quality array of Autofurnish Wiper Blades.